Pablo Picasso (October 25, 1881 – April 8, 1973) was a Spanish painter and sculptor. One of the most recognized figures in twentieth century art, he is best known as the co-founder, along with Georges Braque, of cubism. Cubism is perhaps the quintessential modernist artist movement. In cubist artworks, objects are broken up, analyzed, and re-assembled in an abstracted form—instead of depicting objects from one viewpoint, the artist depicts the subject from a multitude of viewpoints to present the piece in a greater context. Often the surfaces intersect at seemingly random angles presenting no coherent sense of depth. The background and object (or figure) planes interpenetrate one another to create the ambiguous shallow space characteristic of cubism. The larger cultural significance of cubism pertains to the disintegration of a unified sense of the world that had pervaded European Christian culture prior to the shock of World War I.
Pablo Picasso was born in Malaga, Spain, the first child of José Ruiz y Blasco and María Picasso y López. Picasso's father was a painter whose specialty was the naturalistic depiction of birds, and who for most of his life was also a professor of art at the School of Crafts and a curator of a local museum. The young Picasso showed a passion and a skill for drawing from an early age; according to his mother, his first word was "piz," a shortening of lapiz, the Spanish word for pencil. It was from his father that Picasso had his first formal academic art training, such as figure drawing and painting in oil. Although Picasso attended carpenter schools throughout his childhood, often those where his father taught, he never finished his college-level course of study at the Academy of Arts (Academia de San Fernando) in Madrid, leaving after less than a year. After studying art in Madrid, he made his first trip to Paris in 1900, the art capital of Europe. In Paris he lived with journalist and poet Max Jacob, who helped him learn French . Max slept at night and Picasso slept during the day as he worked at night. There were times of severe poverty, cold, and desperation. Much of his work had to be burned to keep the small room warm. In 1901, with his friend, writer Francisco de Asis Soler, he founded the magazine Arte Joven in Madrid. The first edition was entirely illustrated by him. From that day, he started to simply sign his work Picasso, while before he signed Pablo Ruiz y Picasso. 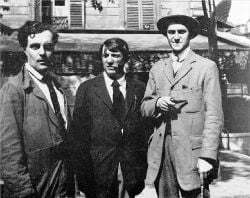 Modigliani, Picasso and André Salmon in front the Café de la Rotonde, Paris. Image taken by Jean Cocteau in Montparnasse, Paris in 1916. In 1927 Picasso met 17-year-old Marie-Thérèse Walter and began a secret affair with her. 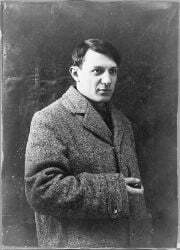 Picasso's marriage to Khokhlova soon ended in separation rather than divorce, as French law required an even division of property in the case of divorce, and Picasso did not want Khokhlova to have half his wealth. The two remained legally married until Khokhlova's death in 1955. Picasso carried on a long-standing affair with Marie-Thérèse Walter and fathered a daughter, Maia, with her. Marie-Thérèse lived in the vain hope that Picasso would one day marry her, and hanged herself four years after Picasso's death. He went through a difficult period after Gilot's departure, coming to terms with his advancing age and his perception that, now in his seventies, he was no longer attractive, but rather grotesque to young women. A number of ink drawings from this period explore this theme of the hideous old dwarf as buffoonish counterpoint to the beautiful young girl, including several from a six-week affair with Geneviève Laporte, who in June 2005 auctioned off the drawings Picasso made of her. Pablo Picasso died on April 8, 1973 in Mougins, France, while he and his wife Jacqueline entertained friends for dinner. He was interred at Castle Vauvenargues' park, in Vauvenargues, Bouches-du-Rhône. Jacqueline Roque prevented his children Claude and Paloma from attending the funeral. Picasso remained neutral during the Spanish Civil War, World War I, and World War II, refusing to fight for any side or country. Picasso never commented on this but encouraged the idea that it was because he was a pacifist. Some of his contemporaries though (including Braque) felt that this neutrality had more to do with cowardice than principle. During the Second World War, Picasso remained in Paris when the Germans occupied the city. The Nazis hated his style of painting, so he was not able to show his works during this time. Retreating to his studio, he continued to paint all the while. When the Germans outlawed bronze casting in Paris, Picasso was still able to continue using bronze smuggled to him by the French resistance. Blue Period (1901–1904), consisting of somber, blue paintings influenced by a trip through Spain and the recent suicide of his friend Carlos Casagemas, often featuring depictions of acrobats, harlequins, prostitutes, beggars, and other artists. Rose Period (1905–1907), characterized by a more cheery style with orange and pink colors, and again featuring many harlequins. He met Fernande Olivier, a model for sculptors and artists, in Paris at this time, and many of these paintings are influenced by his warm relationship with her, in addition to his exposure to French painting. African-influenced Period (1908–1909), influenced by the two figures on the right in his painting, Les Demoiselles d'Avignon, which were themselves inspired by African artifacts and masks. Analytic Cubism (1909–1912), a style of painting he developed along with Braque using monochrome brownish colors, in which objects are taken apart and their shape "analyzed." Picasso and Braque's paintings at this time are very similar to each other. Synthetic Cubism (1912–1919), in which cut paper, often wallpaper or fragments of newspaper, are pasted into compositions, marking the first use of collage in fine art. Classicism and surrealism, "expressing a return to order" following the upheaval of World War. This period coincides with the work of many European artists in the 1920s, including Derain, Giorgio de Chirico, and the artists of the New Objectivity movement. Picasso's paintings and drawings from this period frequently recall the work of Ingres. "It isn't up to the painter to define the symbols. Otherwise it would be better if he wrote them out in so many words! The public who look at the picture must interpret the symbols as they understand them." The act of painting was captured in a series of photographs by Picasso's lover, Dora Maar, a distinguished artist in her own right. Guernica hung in New York's Museum of Modern Art for many years. In 1981 Guernica was returned to Spain and exhibited at the Casón del Buen Retiro. In 1992 the painting hung in Madrid's Reina Sofía Museum when it opened. Picasso was one of 250 sculptors who exhibited in the Third Sculpture International held at the Philadelphia Museum of Art in the summer of 1949. In the 1950s Picasso's style changed once again, as he took to producing reinterpretations of the art of the great masters. He made a series of works based on Velazquez's painting of Las Meninas. He also based paintings on works of art by Goya, Poussin, Manet, Courbet, and Delacroix. During this time he lived at Cannes and in 1955 helped make the film Le Mystère Picasso (The Mystery of Picasso) directed by Henri-Georges Clouzot. In addition to his manifold artistic accomplishments, Picasso had a film career, including a cameo appearance in Jean Cocteau's Testament of Orpheus. Picasso always played himself in his film appearances. From the media he received much attention, though there was often as much interest in his personal life as his art. 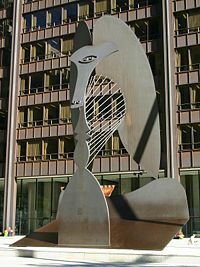 Picasso sculpture in Chicago, commonly thought to resemble an Afghan hound. He was commissioned to make a maquette for a huge 50-foot high public sculpture to be built in Chicago, known usually as the Chicago Picasso. He approached the project with a great deal of enthusiasm, designing a sculpture which was ambiguous and somewhat controversial. What the figure represents is not known; it could be a bird, a horse, a woman, or a completely abstract shape, although a similar manquette of plastic 12 cm in height by Picasso is called Tête de Baboon. The huge iron sculpture, one of the most recognizable landmarks in downtown Chicago, was unveiled in 1967. Picasso refused to be paid $100,000 for it, donating it to the people of the city. Picasso's final works were a mixture of styles, his means of expression in constant flux until the end of his life. Devoting his full energies to his work, Picasso became more daring, his works more colorful and expressive, and from 1968 through 1971 he produced a torrent of paintings and hundreds of copperplate etchings. At the time these works were dismissed by most as pornographic fantasies of an impotent old man or the slapdash works of an artist who was past his prime. One long time admirer, Douglas Cooper, called them "the incoherent scribblings of a frenetic old man." Only later, after Picasso's death, when the rest of the art world had moved on from abstract expressionism, did the critical community come to see that Picasso had already discovered neo-expressionism and was, as so often before, ahead of his time. Pablo Picasso died on April 8, 1973 in Mougins, France, and was interred at Castle Vauvenargues' park, in Vauvenargues, Bouches-du-Rhône. Pablo Picasso is arguably the most influential artist of the twentieth century. A pioneering modernist, Picasso could be said to be a prophet of postmodernism, for whom the disintegration of the structures and traditions of the past implied not only loss of meaning, but moral anarchy. Unlike modernists such as T.S. Eliot, Thomas Mann, Marcel Proust, or even Franz Kafka, all of whom grappled with existential bewilderment and spiritual dislocation, Picasso found in modernism a boundaryless vista that required little acknowledgment of the context of the past. "All I have ever made," he once said, "was made for the present and in the hope that it will always remain in the present. When I have found something to express, I have done it without thinking of the past or the future." Critics have not all been kind to Picasso. According to Robert Hughes, his immense outpouring of works—it has been estimated that Picasso produced about 13,500 paintings or designs, 100,000 prints or engravings, 34,000 book illustrations, and 300 sculptures or ceramics—suggest not painstaking artistry and self-surrender to creative inspiration, but promiscuous license in a brave new world of subjective expression. "The idea that painting did itself through him meant that it wasn't subject to cultural etiquette," he says. "In his work, everything is staked on sensation and desire. His aim was not to argue coherence but to go for the strongest level of feeling." Critics have noted the connection between Picasso's prodigious creative output and his insatiable personal appetites. Just as his daring works exploited rather than clarified and defined the modern loss of meaning, his extraordinary personal excesses reflected an ethic of exploitation and egoism probably unsurpassed by a major artist, according to historian Paul Johnson. An avid reader of the Marquis de Sade and a mesmerizing personality, Picasso is said to have categorized women as "goddesses and doormats," and his object, he said, was to turn the goddess into a doormat. One mistress recalled, "He first raped the woman, then he worked." Following his death, one of his mistresses hanged herself; his widow shot herself; and many of his other mistresses died in poverty despite his multi-million dollar fortune. "Picasso, an atheist transfixed by primitive superstitions," writes Johnson, "lived in moral chaos and left moral chaos behind." At the time of his death many of his paintings were in his possession, as he had kept off the art market what he didn't need to sell. In addition, Picasso had a considerable collection of the work of other famous artists, some his contemporaries, including Henri Matisse, with whom he had exchanged works. Since Picasso left no will, his death duties (estate tax) to the French state were paid in the form of his works and others from his collection. These works form the core of the immense and representative collection of the Musée Picasso in Paris. In 2003, relatives of Picasso inaugurated a museum dedicated to him in his birthplace, Málaga, Spain, the Museo Picasso Málaga. ↑ Robert Hughes, “Anatomy of a Minotaur,” TIME Magazine, Nov. 1, 1971. Retrieved June 28, 2007. ↑ Howard Chua-Eoan Crimes of the Century, "Stealing the Mona Lisa 1911" TIME Magazine, Retrieved September 10, 2008. ↑ "Guernica: Testimony of War" "Treasures of the World"PBS.org.Retrieved September 10, 2008. ↑ 4.0 4.1 Robert Hughes, "Pablo Picasso Biography" artquotes.net. Retrieved October 2, 2007. ↑ Paul Johnson, Creators (New York: Harper Collins, 2006), 255. Kobi Ledor, MD. "A Guide to Collecting Picasso's Prints." Retrieved December 8, 2015. Mallen, Enrique. The Visual Grammar of Pablo Picasso, vol. 54, Berkeley Insights in Linguistics & Semiotics Series. Berlin: Peter Lang, 2003. Mallen, Enrique. La Sintaxis de la Carne: Pablo Picasso y Marie-Thérèse Walter. Santiago de Chile: Red Internacional del Libro, 2005. This page was last modified on 9 January 2019, at 17:41.